The tv show Jeopardy! was and remains on at 3:30 CST each weekday, so watching it was how many a trading day was spent closing out the last 30 minutes of the Globex session back when I used to have the tv on. Since there are a few odds and ends to mention which I don’t want to put into different posts, I’ll just use the catchall Jeopardy! 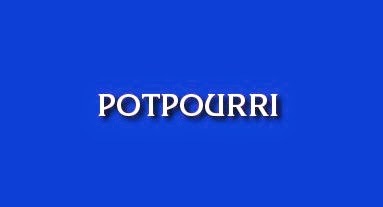 category “Potpourri” to make mention of everything. To keep w/the theme, I’ll come up with five listings since that’s what each vertical has on the show. A couple excellent resources for financial history is the International Bond & Share Society and the Museum of American Finance. The IBSS focuses on scripophily, the collecting of stock certificates, and a few times a year the society puts out a great magazine entitled Scripophily, filled with stories of historical companies and stock or bond certificates. *Update* – the IBSS recently updated their website and I’d encourage any readers of this website to also visit the new IBSS website, scripophily.org to learn of an additionally deep resource on financial history. The MOAF is also quite broad to cover all aspects of economic history, in it’s NYC location on Wall Street and also puts out an interesting quarterly magazine entitled Financial History. The most recent issue of Financial History is quite dry but throughout the year, a lot of enjoyable articles are included to justify a subscription. Membership fees are $32/year for the IBSS and $50/year of the MOAF, small thing to a giant for all you Market Wizards. In regard to this site, a lot of it remains a work in progress w/some legacy stuff I have yet to transfer over from the old tradingpitblog.com site and also building out the Further Resources category which is particularly overdue. Life in general and my many other hobbies have seemed to out-compete for focus and attention compared to this trading pit stuff but I also know that free time and energy will continue to dwindle, so if I put off these improvements much longer then they’ll be harder to finish. At the beginning of the year I was able to visit the grave of a personal hero, Sir Richard F. Burton, and told myself that I still have to raise this project up to his standards. The moment isn’t ready to pour resources into it now but I’d also like to establish bourseophily, which I’d roughly define as the study of financial bourses, the physical environs of these exchanges, the contracts/goods/equities traded and participants who transacted at the bourse. Not sure if I’d ever have enough time to build out the framework as envisioned, but it’s fascinating to learn more of this subject in a more structured manner or just continuing to do so at leisure. Can’t mention Jeopardy! without a “Potent Potables” reference. Trading is incredibly lean these days because no one makes unforced errors although in the days of the trading floor it certainly wasn’t the case. I don’t typically include any stories that were told to me by others but will make an exception in this case, vaguely, since it showcased an extreme of someone who worked on the floor. There was one conversation on the trading floor, well over a decade ago, with a clerk who was telling me what a mess the pit broker he worked for was. On a regular basis, the broker, who held a large institutional deck, would go drinking from the market close until the bars closed. Afterwards he’d pull up to the drive through at White Castle and bark out “gimme twenty dollars worth of food, I don’t care what” and after getting his food he’d park somewhere, eat what he could and then pass out for a few hours. 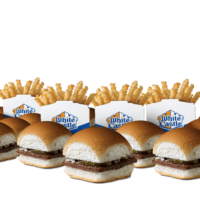 When the sun would rise, so would he and on the drive downtown to the exchange he’d toss the White Castle leftovers on the front of his dashboard and crank the heat to warm up the remaining sliders as his breakfast, gross. Last week in SF, I went to a local bookstore to listen to an author event with Mary Pilon speaking of her excellent NYT best seller The Monopolists and Mark Braude speak on his new release Making Monte Carlo. To hear authors share the story of their writing, process and book subject matter was a great way to spend an hour, certainly the type of thing I plan to do more often. One positive result from the article was a lot of hand signal submissions which came about due to the exposure. Additionally, it was also educational to learn of the media cycle and how a story in a global publication like the WSJ is picked up in so many regional outlets worldwide and rewritten as if the regional author originated the story. The only change I’d make to the article would have been to inserted the word “American” before “citizens tour to North Korea,” perhaps it was cut to fit the print properly. I’m short on a fifth entry so will just post up a great piece of art that I enjoy seeing a couple times a day when going to get coffee at my usual coffeeshop in SF. 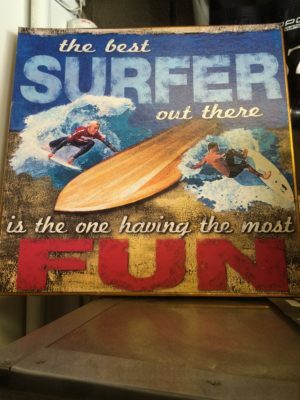 “The best surfer out there is the one having the most fun.” I’d consider the best trader the same way, not based on P/L, AUM or anything of that sort but how much fun they have enjoying it which is a sharp juxtaposition to how the entire financial industry operates. While winning trades are the biggest part of having fun in trading, it’s certainly not the only component and imagine others who started out on the trading floor would tend to agree. Now that I think of it, there’s a friend of mine whose mnemonic on LIFFE was actually FUN so I’ll have to pass this photo his way.